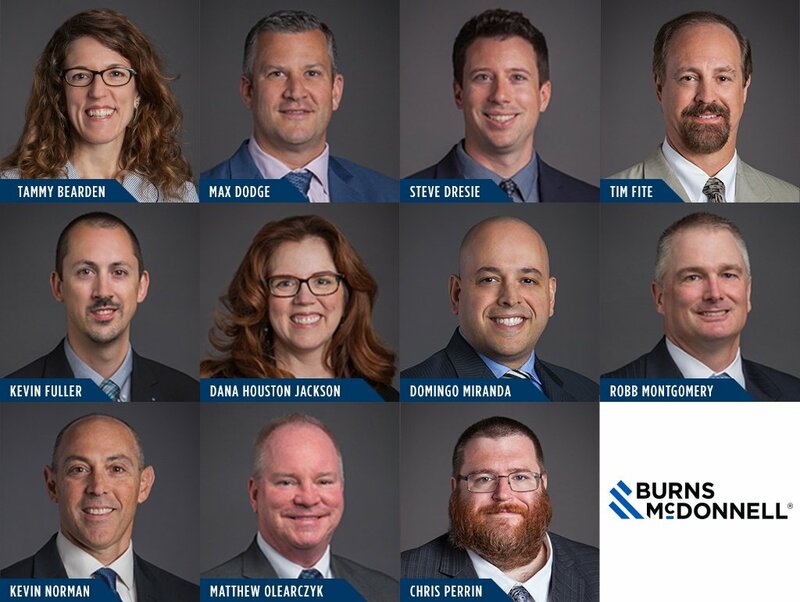 KANSAS CITY, Missouri (Sept. 6, 2018) — Burns & McDonnell is strengthening its growing Business & Technology Solutions (BTS) Group, bringing in experienced professionals to amplify the ability to deliver the right technologies, systems and services for clients. The team is adding depth and capabilities as Chris Underwood, general manager, BTS Group, leads the charge to mobilize change in the landscape of the firm and industries it serves. Bearden, a senior analyst, will lead research for the group’s strategy and innovation department, which guides strategic direction, partnerships, investments and innovation for the firm. She brings 22 years of experience and a diverse set of skills, including managing competitive intelligence and research projects for attorneys, investment bankers, marketers, product managers and executives. She has managed multiple knowledge management transformations, technology enablement projects and innovation workshops. Dodge joined as business development manager, responsible for managing and overseeing the sales and marketing team and driving revenue growth for clients throughout North America. Dodge leads a team working to maximize clients’ return on investment in technological tools and systems and using technology to improve business operations and manage regulatory risk. Throughout his career, Dodge has worked in the cybersecurity and information security industry, providing clients with the right solutions to enable day-to-day operations and manage risk. Before joining Burns & McDonnell, he helped launch an international cybersecurity company in North America, delivering innovative and tailored security solutions to large enterprise and public-sector clients. Dresie joined as software and technology consulting manager, where he is leading and managing the expansion of technology teams focused on providing digital transformation services across the spectrum of industries served by the firm. Dresie’s teams combine deep engineering and domain experience with a broad range of technical capabilities to develop innovative solutions driven by data, intelligent integration and proprietary software enabling customers to deliver on their business objectives in a new era of disruption. He brings more than 15 years of experience in leading teams that develop technology solutions and partner with customers to address business challenges. Fite is a senior software architect and developer and will focus on software development for commercialization within the firm and serving as a consultant for technology consulting engagements. He has 25 years of information technology experience, with the past 20 years focused in the software engineering industry. Fite has held a variety of positions in his career including chief information manager, software architect and software engineer. As security consulting manager, Fuller is responsible for expanding Burns & McDonnell’s cyber and physical security presence and solutions across utility, industrial, federal, aviation, commercial and other markets. Fuller has more than 15 years of experience in the development and implementation of security strategy, building full-service security programs to combat critical infrastructure threats. He has managed the support of IT production systems and technical road map development for commercial and defense divisions. Houston Jackson, a project and change manager, is focused on enterprise/organization change management to prepare, equip and support clients through complex change in order to meet business objectives. Houston Jackson’s more than 25-year career includes experience in a variety of industries including construction, engineering, power utilities, IT, transportation, manufacturing, nonprofit, human relations, consulting and academia. Miranda, a strategy consultant, leads efforts related to electric vehicle transformation strategy for the firm. In his new role, he will partner with clients across market sectors to implement strategies that enable their transition to transportation electrification. Miranda has more than 20 years of consulting, project management and planning experience. He has collaborated with equipment providers, strategists, customers and utilities within the electric vehicle industry. As a technology consulting project manager, Montgomery leads business transformation initiatives with information technology (IT) and operational technology (OT), in addition to managing the project management office for BTS. He brings 25 years of experience across all areas of IT, including complex transformation program management and project delivery using a range of methodologies. He previously managed multi-year global engagements with budgets exceeding $100 million with clients in the energy, chemicals, natural resources and utilities industries. As a strategic partnership manager, Norman is strengthening a network of external solution and service providers to enhance offerings and empower client success. By developing and extending partnerships with third-party solution providers, Burns & McDonnell continues to build upon its core strengths in providing engineering, design, architecture, construction and consulting services for utilities, manufacturers, industrial clients and more. Norman comes to Burns & McDonnell with more than 15 years of experience, including leadership of a program with more than 500 partners representing more than $300 million in business for a major health-care technology firm. As a utility consulting project manager, Olearczyk is responsible for growing and managing consulting services focused on helping utility companies manage urban secondary electrical networks. He brings more than 35 years of experience in the utility sector helping utility clients identify and execute leading industry practices to solve business challenges. Olearczyk specializes in working on urban secondary network power grids to improve safety, reliability and efficiency. As a development manager, Perrin will lead commercial software development for BTS. With more than 20 years of experience in the software development industry, Perrin has performed every function in the full systems development life cycle including fulfilling the roles of software engineer, manager, architect, data analyst, data architect, scrum master and project manager. The BTS Group provides consulting and advisory services, developing innovative solutions by leveraging emerging technologies to drive impactful business outcomes for clients. From advising clients on business strategies to leading IT/OT transformation initiatives, and from creating mobile applications for field data collection and asset management solutions to providing holistic cybersecurity solutions, the group works to provide clients with business opportunities during a time of transformation and guides organizations down a path to faster, smarter and more sustainable solutions.